Wow, it's been well over a month since I took my mini-vacation to Vermont and here I am still posting pictures! Something tells me that I took way too may of them! 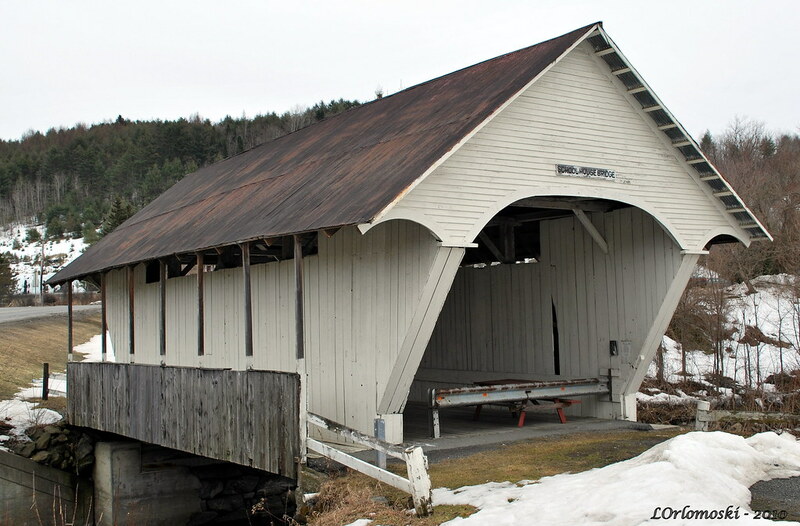 This should be the last post, though, and it contains pictures of the covered bridges that were close by where I stayed in Lyndonville as well as one other bridge that crosses the Connecticut River. It was a bit of a drive from where I was but I really wanted to see it so didn't mind the 45-mile detour to do so. 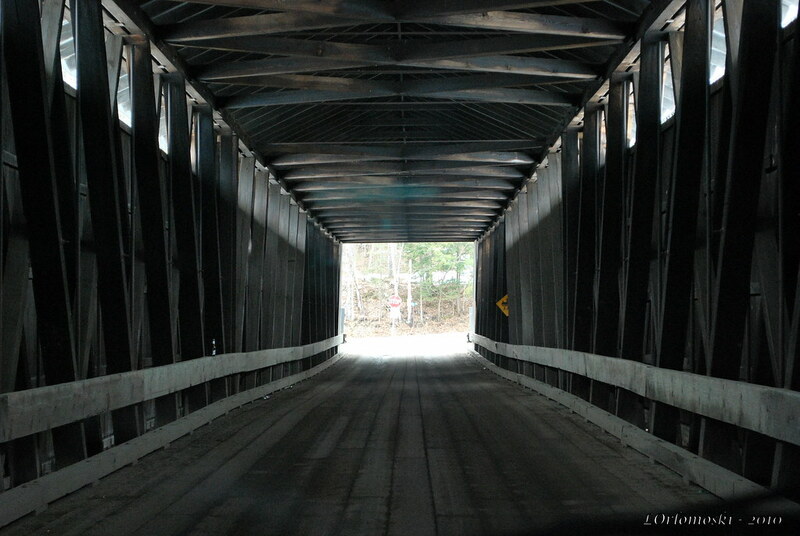 Plus it seems rather appropriate that I started out my covered bridge posts with the Cornish-Windsor Bridge crossing the Connecticut River so it seems appropriate that I end with another Connecticut River bridge! 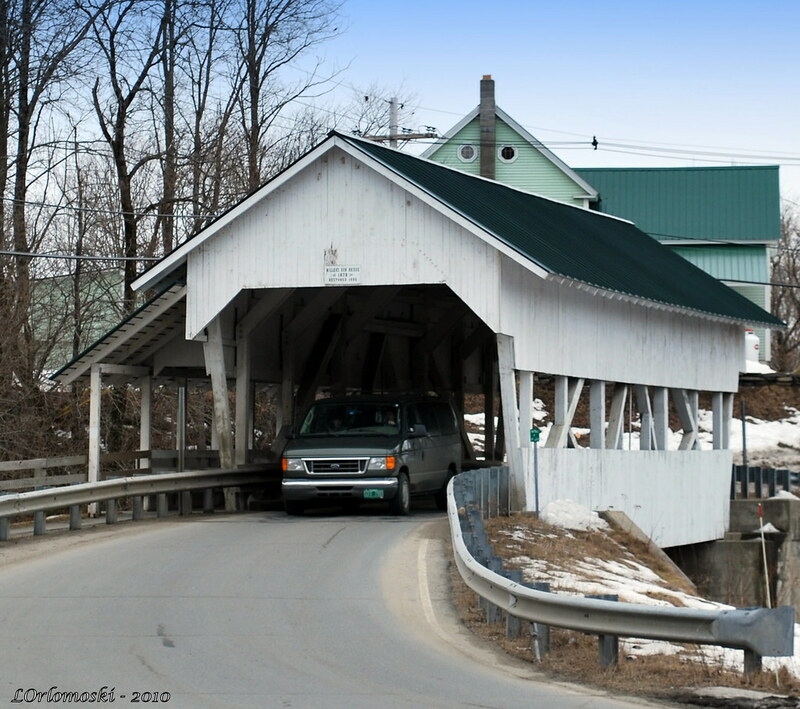 However, before I get ahead of myself, "The Northeast Kingdom" town of Lyndon touts itself to be the "Covered Bridge Capitol of Vermont" as there are five covered bridges located within the town's borders but - to be honest with you - I really wasn't overly impressed with any of the bridges the town boasts about. Matter of fact, one of them was so pathetic that I didn't even bother to take any pictures of it as it's located behind a motel and looked to be in pretty sad shape. Not to be a covered bridge snob, mind you, but The Sanborn Bridge, which is privately owned, was just too sad and pathetic standing out there behind the Lynburke Motel looking all forlorn and beat-to-heck that even though I drove past it at least four times, I just couldn't bring myself to stop. I'm thinking maybe it looks better in the warmer months? Anyhow ... what other bridges did Lyndon have to offer? 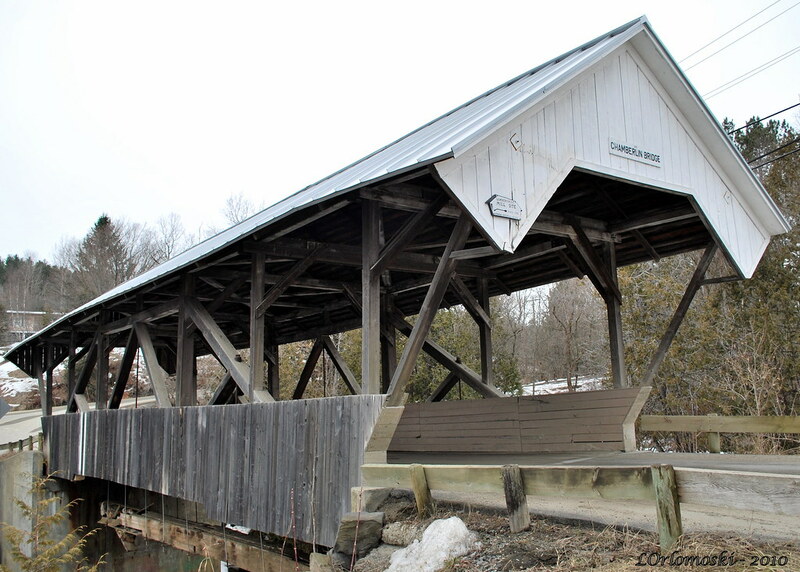 Well, there's the Schoolhouse Bridge which was built in 1879 and replaced a much-criticized uncovered bridge that spanned the south branch of the Passumpsic River. The bridge is of the Queenspost style and has a 42-foot span. It's builder made its eaves wider than normal as a way to protect the side of the bridge so it almost looks like it has wings. The bridge is off the road but does still span the river so even though it looks like it's seen better days, it's still a darned sight better than the aforementioned Sanborn Bridge. 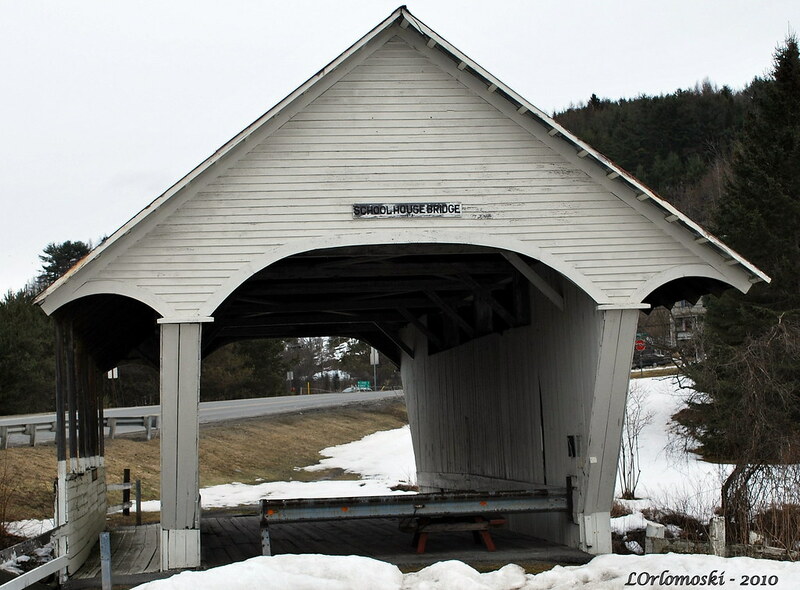 If you look inside at the walls of the bridge, you'll see that it is possibly the only covered bridge in Vermont to have both sides of the trusses boarded in order to keep school children from climbing on them! Ah, those pesky school children! This bridge also crosses the south branch of the Passumpsic River also known as Branch Brook and is another Queenspost style with a span of 66 feet. The Chamberlin Bridge is unique in that has very distinctive and open gables which allows better driver visibility though I suspect that doesn't help protect the roadway all that much when the wind and rain are blowing inside. There was actually quite a bit of traffic over this bridge while I was taking pictures but not near as much traffic as there was going over Miller's Run Bridge aka the Bradley Covered Bridge. 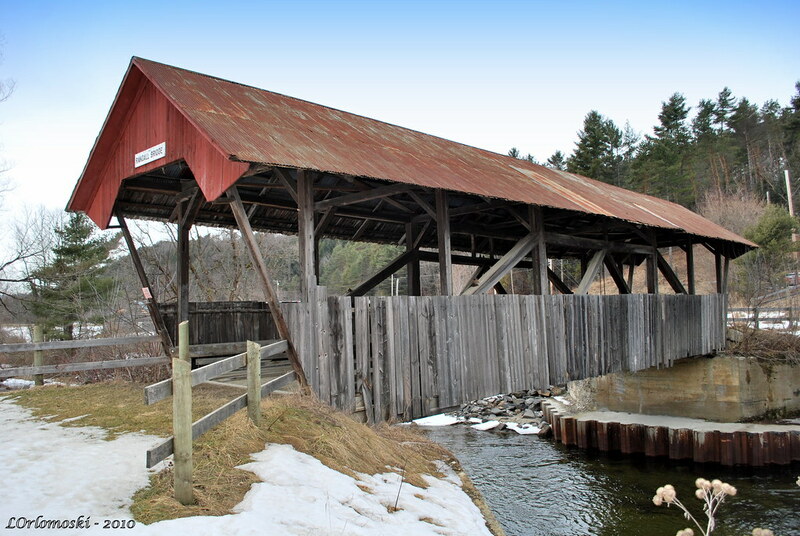 Originally built in 1878, this 68-foot Queenspost style bridge which spans Miller's Run on Route 122 was totally reconstructed in 1995 and is the only covered bridge in Vermont still in active use as part of the State highway system. 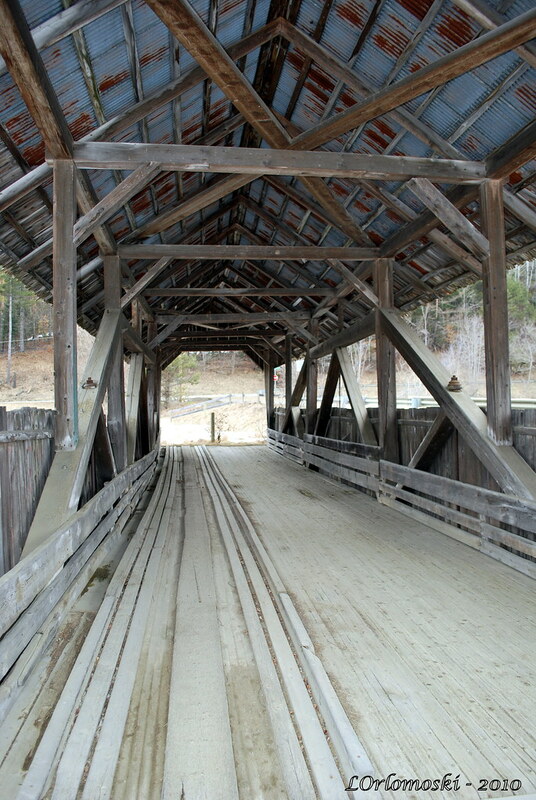 One of the most interesting features of the Chamberlin Mill Bridge is the covered pedestrian walkway that runs along the side of the bridge. Considering the amount of traffic that goes over this one-lane bridge, a walkway for pedestrians was a great idea! 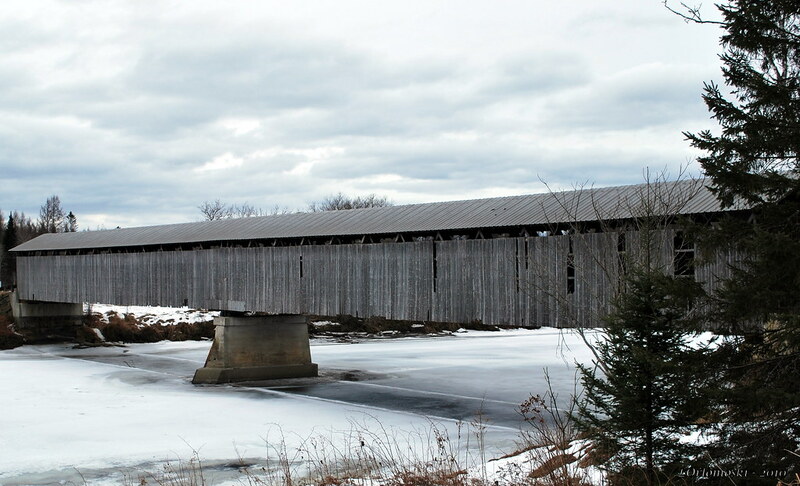 The last covered bridge in the Lyndon area was the Randall Bridge that is located on the outskirts of town heading towards the village of Burke. Built in 1865, the 68-foot Randall Bridge crosses the east branch of the Passumpsic River just off of Route 114 and is of the open Queenspost design. A new cement bridge was built adjacent to the Randall Bridge in 1965 but the original bridge was left to span the river. For awhile it was used as a snowmobile crossing but there are signs posted now that the bridge has been deemed unstable and it's not even wise to walk across it. I didn't and maintained a healthy distance while taking pictures of what was obviously a worn deck. All things considered, I would have to say that the Randall Bridge aka Burrington Bridge was my favorite of those in Lyndon in spite of its beat and weathered condition. Or maybe it was because of its beat and weathered condition! Finally leaving Lyndon behind I drove east on Route 2 towards New Hampshire in search of the Mount Orne Bridge which spans the Connecticut River between Lunenberg, Vermont and Lancaster, New Hampshire. 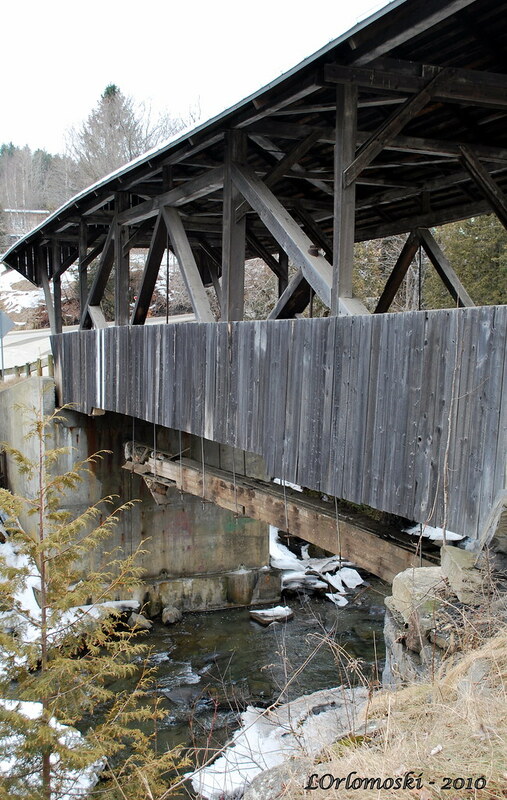 The Mount Orne bridge was built in 1911 but was not the first bridge to span the river at this point. The first bridge was built in either the 1860's or 1870's and was operated as a toll bridge until it was destroyed by a log jam in 1908. For the next two years a ferry service operated between Lunenberg and Lancaster until the Mount Orne bridge was completed. 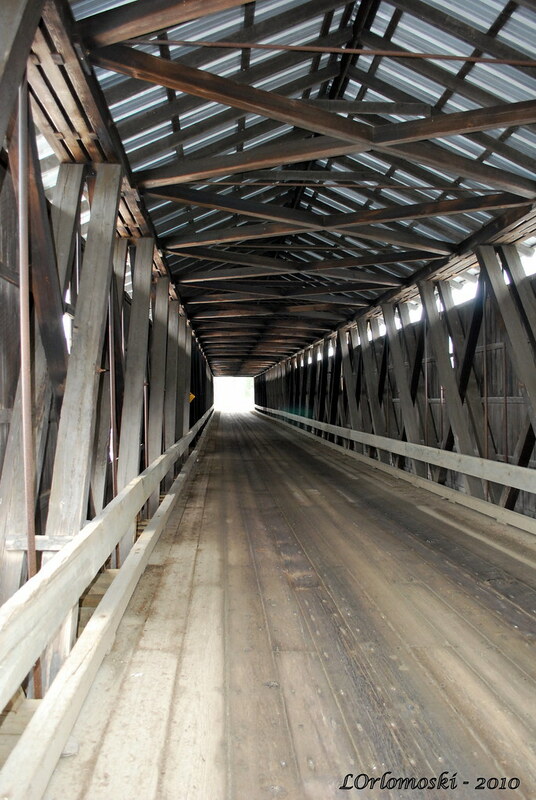 The bridge uses William Howe's wood and steel design and consists of two spans with a total length of 266 feet. 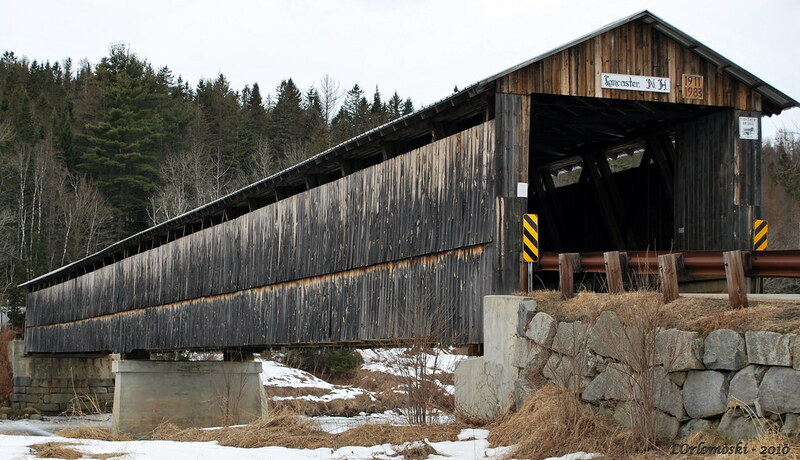 The bridge, like the Cornish-Windsor Bridge that I wrote about earlier, is technically a New Hampshire covered bridge as the state line is at the western shore of the river and it only "touches" Vermont but I wasn't going to squabble as I really liked the weathered look of it. This view is from the New Hampshire side of the bridge and I thought the difference between the north side of the bridge and the south side was quite fascinating as it was easy to see that the south side was a lot more protected and not nearly as weather-beaten as the north. ... but as soon as I slowed down for the one shot, I noticed that someone had pulled up to wait for me to get through the bridge so that they could cross. Oh well, at least I got one picture! And whither then? I cannot say." 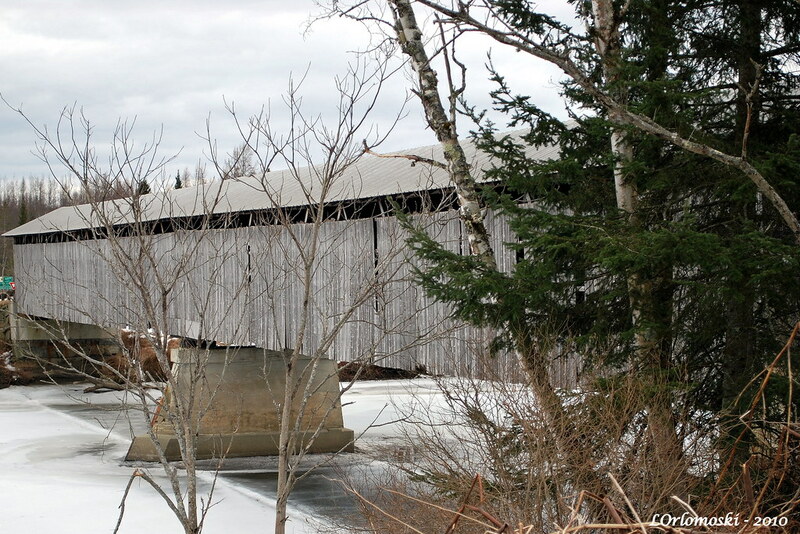 I thoroughly enjoed the Vermont Covered Bridge series, Linda! I can't wait for your next installment. Now I'll be humming Bilbo's song all day! Me, too. What Barb said. You do this sooo well! How fun Linda. 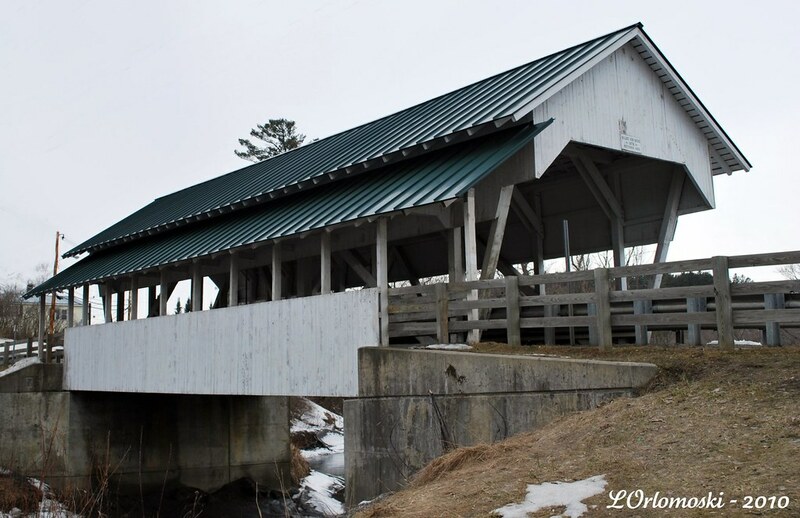 I so love covered bridges and it sure looks like you have a lot in your neck of the woods. That's great. You could fill up a memory card with 1500 pictures and I don't think that would be too many. As long as you've got enough digital storage, then click away I say! Wonderful pictures of bridges, my favorite song from The Hobbit and closed with that wonderful picture of The Road of unlimited possibilities. Great post today. 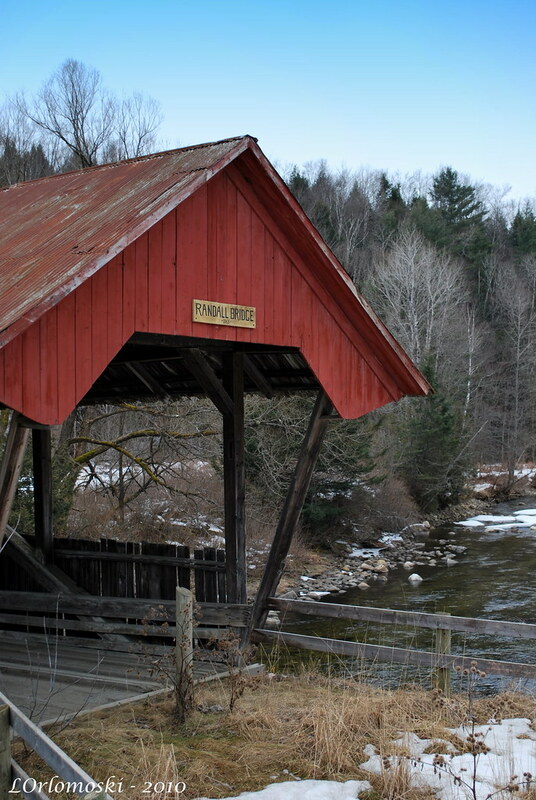 You can be a covered bridge snob if you like! That cracked me up. I really like the design of the schoolhouse bridge. The covered pedestrian walkway on the Chamberlin Mill is a nice touch. They all looked kinda "beat" to me. In a good way of course. 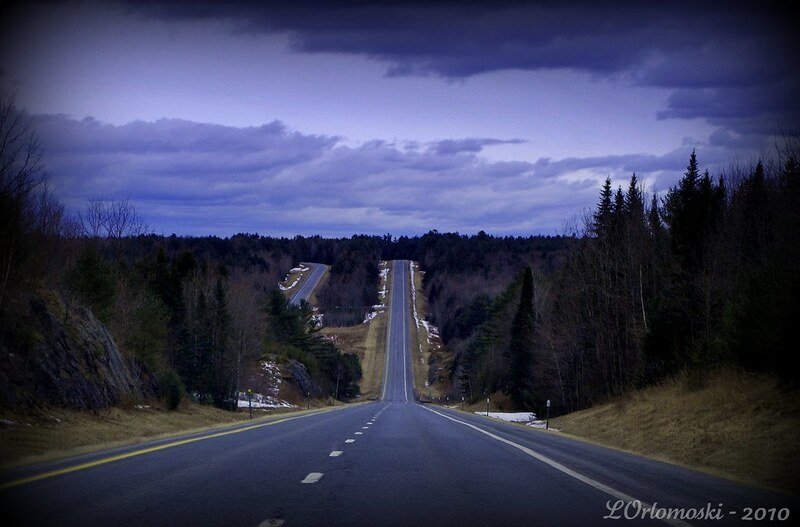 And the last photo of the road leading us into the horizon is wonderful. I remember that one from a few weeks back. It has an air of mystery.. This has been a great series, Duchess Linda! 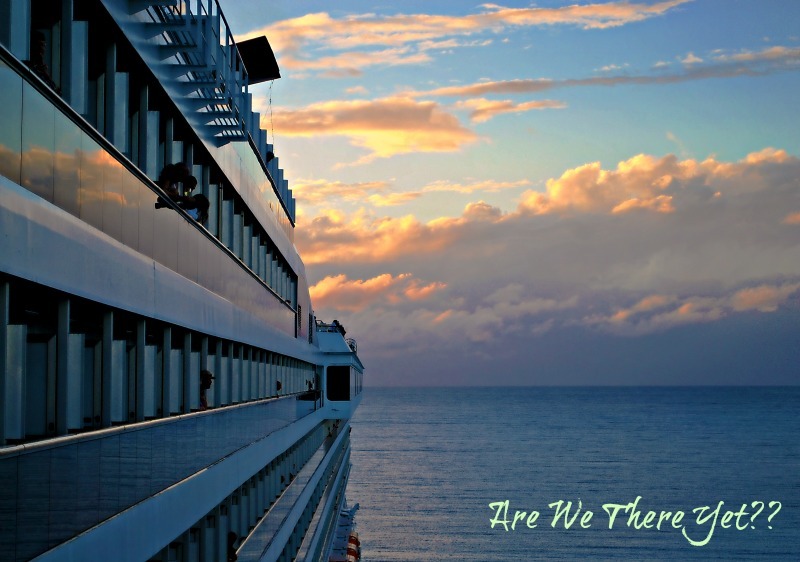 You have a great sense of adventure and I love your photos!